A blog about my life and (mis)adventures around Geneva. Its about the dcomplications & absurdities of moving to another country in midlife & watching how my own biases & past so color the way I experience life here. 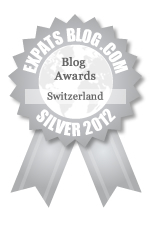 ExpatsBlog.com Expat Blog Awards 2012: Switzerland Silver Award! It is a pleasure to read an intelligent account of Bela's adventures in Geneva. Change is what so many families are experiencing today and her accounts of her experiences are motivational, inspiring and funny. It takes the angst out of a mid life move making us see that the old cliche is true " life is what you make it," and Bela makes it very good. Bravo Bela. Good blog. like the way author compares east and west and finds so many similarities in a very insightful way. Always enjoy reading Bela's blogs.After describing Switzerland's natural beauty,all of a sudden ,she springs a wonderful surprise of the Bhutan Bridge which itself a creation of beauty.Her comparison of the east and west makes us realize that tho apart,we are still very close.Looking forward to her next blog. Bela's sense of subtle humour is her forte and signature tune so to speak and this comes out so clearly in the blogs. I loved the one about education - after all, we are plebians and love that, don't we? The mix of east and west, which I am sure would have been a difficult transition, is described in an undderstated manner. Enjoy reading her blogs - keep it up, Bela. Really enjoy reading Bela's blog and learning new things about my recently adopted country. This is a good window to Switzerland. Interesting tidbits of information. Funny in a nice way.